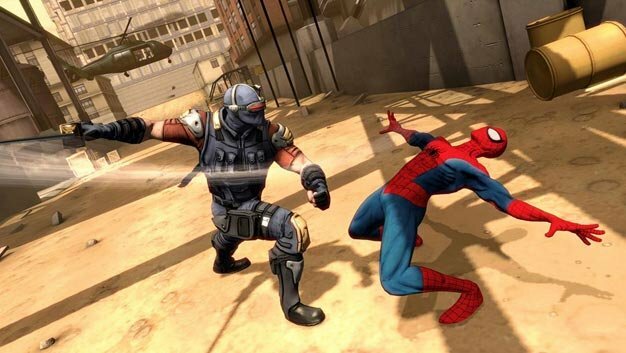 There’s a new Spidey game swinging our way, called Spider-Man: Shattered Dimensions. Here’s a trailer and screenshots for it! Shattered Dimensions will feature four different Spider-Men swooping around four different Marvel universes, apparently. Hence the title. This trailer reveals the first two: the comic book-esque ‘Amazing’ and the darker, grainier ‘Noir.’ ‘Noir’ reminds us a bit of Arkham Asylum. So for Amazing Spider-Man this means web-based combat. According to Morgan you’ll be making giant web-hammers and staffs, shooting web-balls, as well as picking stuff up from the environment to chuck at enemies. Meanwhile, for Noir Spider-Man you’ll have to get stealthy, taking down baddies from the shadows. It all sounds pretty good to us. Looks ok too. Wonder what the other two dimensions are?